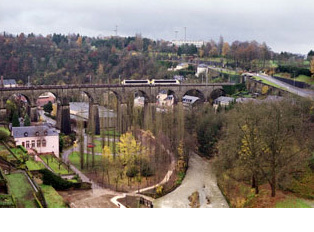 In Luxembourg, local trains run from approximately 5:00 a.m. until about 11:30 p.m. International trains run at all hours of day and night. Local trains run frequently during the day and less often in the evening. The same tickets are used for local buses and local trains. Tickets can be bought individually or in packets inside the train station. One ticket is usually good for one hour of local travel, and the ticket must be validated before boarding the train. One can ask an attendant at the station how many tickets will be necessary for a particular destination. Inside the station, there are detailed maps of destinations with information about how many tickets the trip requires. Although there are no concession stands in the train station, there is always a place to buy refreshments or newspapers nearby. "Announcement Display Inside the Train"